본 논문은 수원 화성(華城)의 무형 문화유산인 ‘무예24기’를 문화콘텐츠로 개발하는 방안에 대하여 구체적 사례를 들어 설명한 글이다. 특히 무예24기 중 기병들이 익혔던 마상무예를 집중적으로 연구하여 향후 지역 역사문화 콘텐츠 개발에 도움을 주고자 하였다. 정조시대에 완성된 병서인『무예도보통지(武藝圖譜通志)』는 수원화성을 집중적으로 방어하던 장용영 외영의 군사들이 익혔던 무예였다. 따라서 유형의 수원 화성(華城)과 무형의 무예24기를 조화시켜 문화콘텐츠로 개발한다면 시너지 효과를 극대화할 수 있음을 확인하였다. 구체적으로 전통공간 복원 및 전시를 통한 전시 콘텐츠 개발과 화성내의 마상무예 및 군사사 관련 체험관광 콘텐츠 개발 등으로 구분하여 문화콘텐츠 전략에 대해 언급하였다. 또한 향후과제와 전망을 통해 전통무예에 대한 체계적인 연구 및 복원을 위한 ‘무예24기 중앙 전수관’의 건립 및 시범단의 시립화와『무예도보통지(武藝圖譜通志)』의 유네스코 세계무형문화유산 등재의 필요성을 확인하였다. 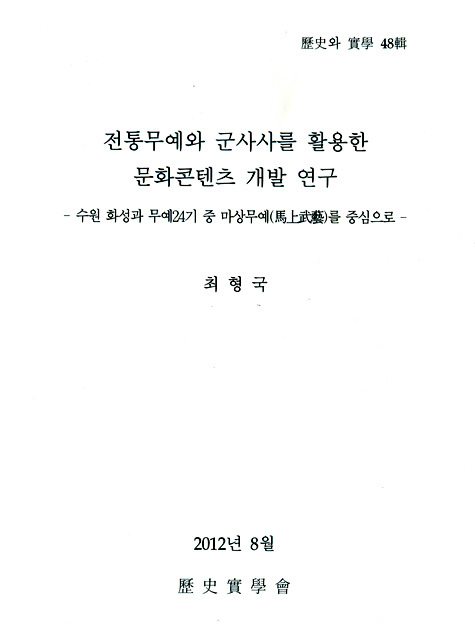 This study deals with measures to develop cultural contents based on '24 martial arts(Muye 24ki)' which is intangible cultural heritage of Hwaseong Fortress in Suwon by raising subtle examples. Especially, this study tried to be helpful for future development of historical and cultural contents for region by concentrating on study about Martial arts on horseback among 24 martial arts. Muyedobotongji(武藝圖譜通志) completed in Jeongjo reign in Chosun includes martial arts that soldiers in Jangyongyeong(壯勇營) practiced - the soldiers guarded Hwaseong Fortress in Suwon. Accordingly, it was identified that if cultural contents where tangible Hwaseong Fortress in Suwon and intangible 24 martial arts are in harmony, are developed, this could lead maximized synergy effect. Specifically, cultural contents strategy was mentioned by classifying contents to development of exhibition contents through restoration of traditional space and exhibition, development of contents for tourism through experience related to Martial arts on horseback and military history in Hwaseong Fortress. And it was identified through further task and perspective that it is necessary to construct 'central training hall for 24 martial arts' for systematic study and restoration of traditional martial arts, to list Muyedobotongji(武藝圖譜通志) on UNESCO world intangible cultural heritage. * 한국역사실학회의 <역사와 실학>은 한국연구재단 등재후보지입니다.